Wing is a proposed development of 160 acres of land, north of Cambridge International Airport including 1,300 new homes. 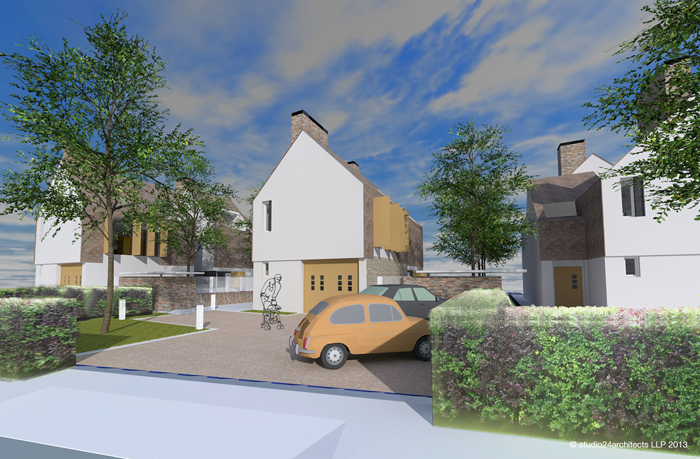 The Marshall Group invited architects with a Cambridge connection to provide ideas for the design of a single dwelling from a choice of six house types. Conceived as a home for life, studio 24’s design for a detached house is planned to support and adapt to changing family needs in a highly innovative and forward looking City. The fixed volume concept provides flexible living through its adaptable internal open plan spaces. Internal atria enable spaces to be annexed to cater for home working or later life access requirements. A car port and usable roof space provide opportunities to expand and contract the liveable space. Two connected volumes orientated east west, each based upon a square plan have a simple saddle roof. To prevent these imposing an overly traditional form of architecture, the structures have been made abstract where possible, such as wrapping the roof material down over the first floor facade. Appearing to resemble Dutch gambrel roofs (found locally in late medieval buildings), the gault clay tiles are replaced with metal shingles. The shingles create a reference to the sites association with aviation and the use of tile hanging found locally on 1950’s housing in Cambridge. Large solar adaptive openings reinforce the abstract modern character replacing the traditional bay window. Roof openings subvert the traditional dormer window. Chimneys service interior ventilation and heat recovery, while reflecting a local roof heritage. A super-insulated, airtight, cross laminated timber structure would be precision made off-site to create the primary solar responsive envelope. The building services are designed around a fixed volume and orientation, coupled with assisted ventilation and heat recovery to reduce long term energy demands and provide long-term performance to the occupier.